The power of scent can bring back memories, calm the spirit, and energize the mind and body. However, essential oils are more than just pleasant smells. Essential oils can have a healing effect physically, mentally and emotionally. The power of scent can bring back memories, calm the spirit, and energize the mind and body. However, essential oils are more than just pleasant smells. Essential oils can have a healing effect physically, mentally and emotionally. The Essential Results Now Kit comes with six healing oils: Ravensara, Birch Sweet, Marjoram Sweet, Cypress, Rose Geranium, Lemongrass, and one oil blend: To Be At Peace. 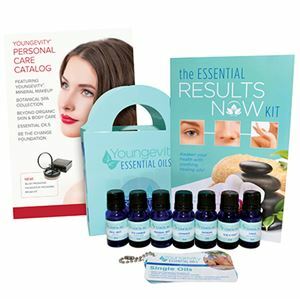 A guidebook of how to use each oil, how to assess oil needs for yourself and others, and how to target seven body systems using essential oils, is included. Awaken your health with soothing, healing oils! Personal care product catalogs also included.